Displaying a minimalist architectural approach, today's 360° project is a one-storey family home located in the city of Omura in Japan. Built on a 397sqm plot, and occupying a floor space of 144sqm, this modern home has been crafted keeping energy efficiency in mind. The rectangular box-shaped structure is intended to have a minimum impact on the environment and is a gorgeous example of a minimalist, modern building masking warm and cosy interiors. Real estate in Japan is one of the most expensive in the world, thanks to the high population density and since the country is an earthquake-prone area, there are strict rules when it comes to constructing high-rise buildings. 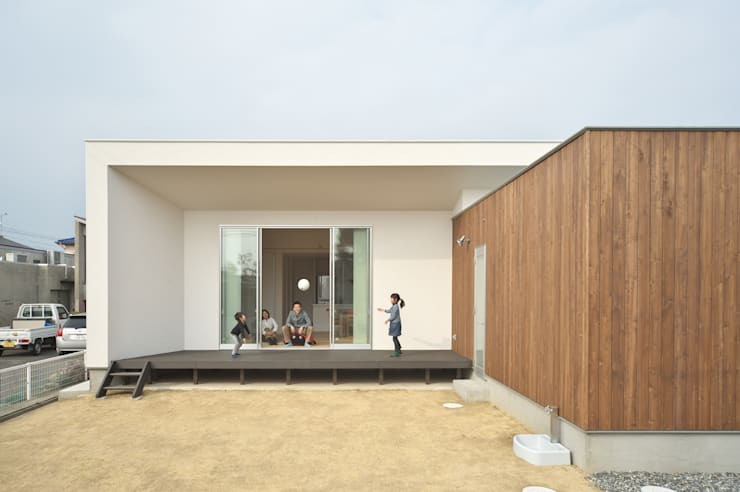 These factors along with others means that the Japanese often have to come up with innovative and cost-effective ways to build their dream home, like the one we will explore today. 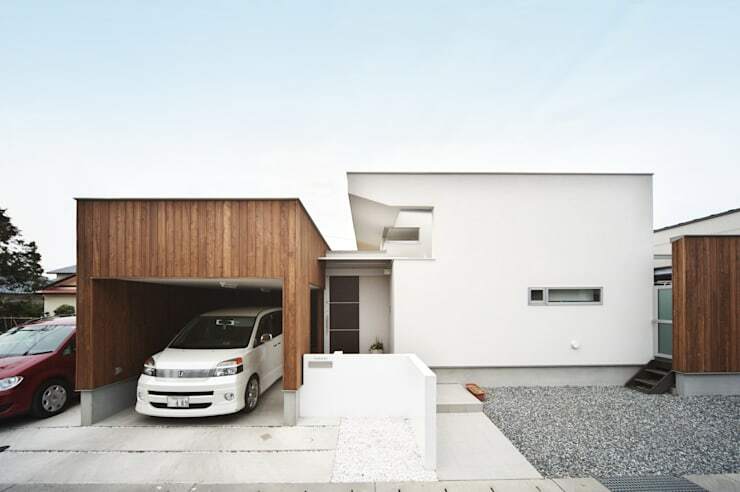 In a neighbourhood of traditional sloped roof houses, this unique home stands out as a modern home inspired in spades by traditional Japanese architecture. One of the first things you notice about the exterior of the house (seen here is the back portion) is the multidimensional effect that has been created by recessing one portion of the main volume, while visually separating it through the use of different materials. Large glass sliding doors and a cantilevered deck ease the division between the interior and the exterior. The wooden-clad box structure on the right is actually the rear portion of the garage in the front yard. When you think of a box structure, clinical images springs to mind but here, the designers have to managed to create a welcoming exterior. As soon as you step inside, the sleek minimalism that we saw outside is toned down to create a softer, warmer interior. 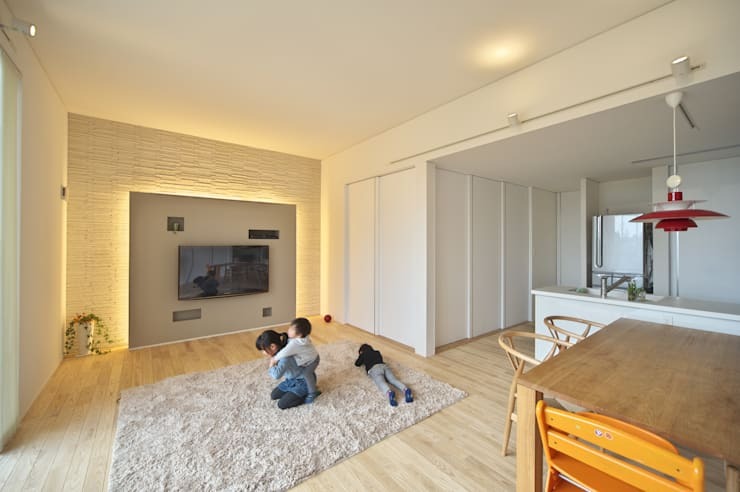 Open-plan designs are a favoured feature in Japanese homes, and we see the same design aesthetic applied here. The living room, dining area and kitchen all form one large communal area without seeming like they are jostling for space. The focus wall housing the TV is the highlight here—easily visible from both the kitchen and the living room. Note how storage has been taken care of by incorporating plenty of in-built closets in the wall space. The bright, airy space has been designed as the nursery and kids room, but doubles up as a relaxation zone for the adults as well. 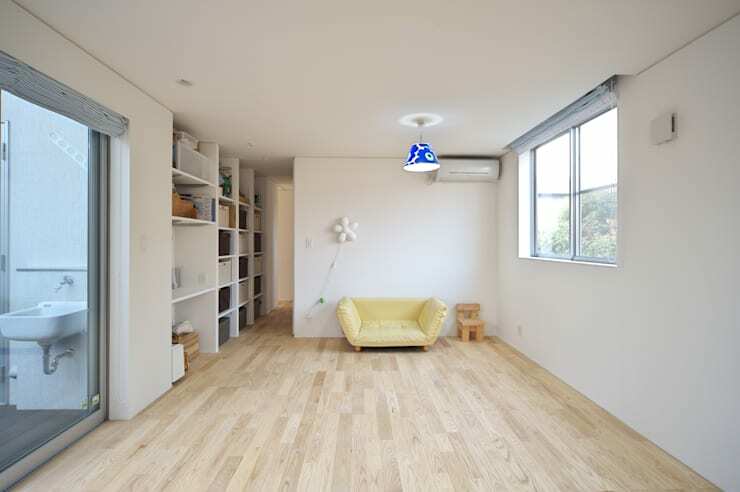 The crisp white walls and the light timber flooring allow sunlight to enter in and bounce off of it. A neatly organised shelf cabinet ensures that files are tucked away and toys are put away when not in use. Speak to our experts to get more ideas on organising your space. On the left is a small interior courtyard that is used as a playground by the children as well as a mini-entertaining space by the adults when guests come over. 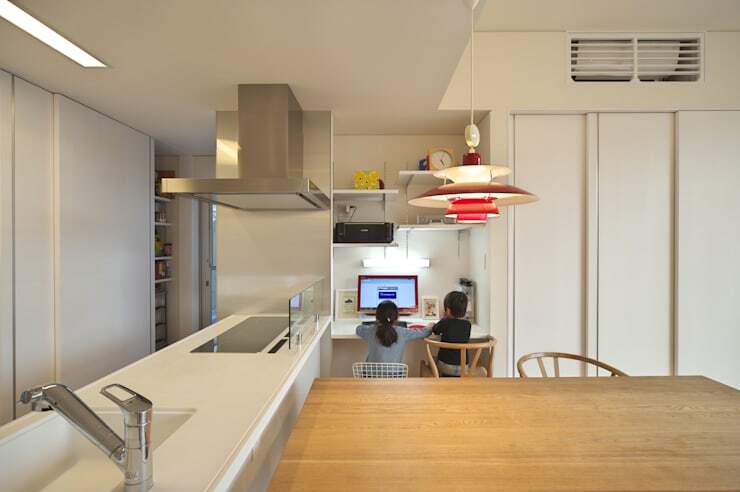 From this view, you can get a closer look at the kitchen, and that smartly designed study! A study is one of the first things that is chucked out of the window when space becomes an issue, but that doesn't need to be the case. You can take a cue from the architects here, and incorporate a custom-made study into a recess space anywhere in your house. Here, it takes up room in the alcove between the kitchen and the closets. Since the owners wanted the storage cabinets to be as inconspicuous as possible, the kitchen cabinetry too has been done up in all-white and mirrors the design of the closets on the right. We leave you with the image of the entrance of this modern family home. You can see the front portion of the garage, which closes down when not in use and the entrance door which is discreetly tucked into a corner. There's also a second doorway that connects the interior courtyard to the outside. By subtly playing with volumes and levels here, the architects have created a unique visual element. To check out another modern home (with traditional design features), go to The simple home of cool concrete. What did you think of this unique yet cosy family home?